Transform into your Mega Gunship boss form to blast your rival head-on in this unique shooting game with a competitive twist. Rival Megagun is a competitive split-screen vertical shmup (or shoot ’em up, shooting game, STG) where you transform into a gigantic boss ship – your “Mega Gunship” – to invade your opponent’s screen. Build up your chain and unleash devastating attacks. Multiple heroes to choose from, each with their own set of special weapons and Mega Gunship form. Features intense 2-player local and online versus battles and a single-player arcade mode. 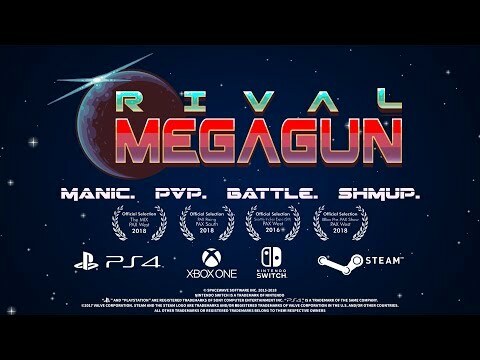 Rival Megagun was released on Switch 137d ago in the US and the UK. Notify me when Rival Megagun is available.